I recently stitched up this little picture for my aunt, unfortunately I couldn't join her and my mom and my cousins for a week in the sun and had to make do with the photos instead! I am pretty sure embroidery was my first step into sewing, my mom used to do it and all the women on my dad's side of the family. My first attempt at 'free-style' embroidery was when I was given my uncles denim jacket which had badges for bands such as AC/DC and Rainbow on it. So off they came and into the bin they went (sorry Simon!) but then I was left with dark patches on the jacket so I chucked the jacket in the bath with some bleach, yes the bleached tie-dye effect! Then I sewed on some fabric and embroidered some swirls on it, how I loved that jacket and what a shame I have no photographic evidence of myself wearing it. Anyway... I love the fact that embroidery has come back into vogue both on the high street and in the crafting world. 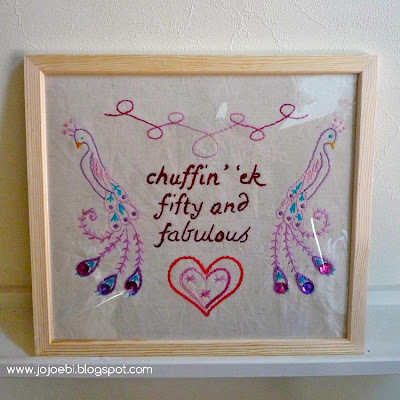 I was given Embroidered Effects by Jenny Hart of Sublime Stitching fame and I love it! The book is broken down so there are sections on tools, fabrics, pattern making, stitches and methods of stitching, stitch combinations and special effects and then a load of projects to get your teeth into, finishing the projects and a set of patterns. The peacocks above are one of the designs from the book. I am pretty much OK with many of the stitches, there are a few in the book that I haven't tried before and the diagrams and explanations are easy to follow. I also really like that it is spiral-bound so that it lies flat when you are using it and they have provided a pocket at the front to keep the patterns in, brilliant. 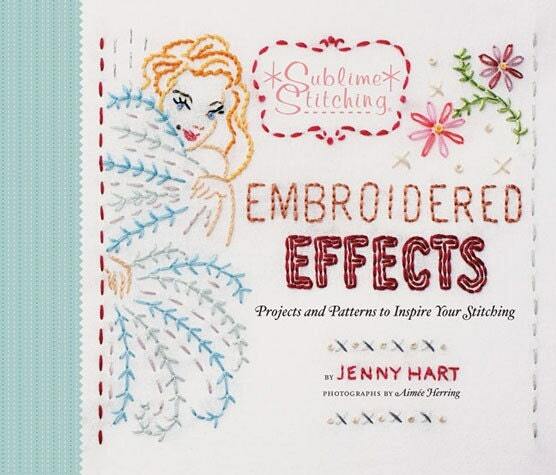 Jenny makes embroidery fun, she uses cheeky designs and ideas and I am pretty sure a total beginner would be able to pick up and stitch using the book as a guide, so if you have been thinking of taking up a new hobby, pick up the book and give it a go! ohhh... I can only imagine the time they take... lovely.